Remember this crazy quilt? After many months of procrastination it’s finally finished! I think it may become baby’s first playmat. What with all those colors and patterns, I don’t think you’ll ever see a stain! I went back and forth on a backing, but ultimately settled on this great gray and white polka dot (Michael Miller Quarter Dot). I love the gray, and I think it lends a bit of calm to an otherwise crazy quilt. I initially started quilting it with a loopy meander, but it was looking wrong, so I ripped it out and went for a favorite – random straight line quilting. I think it goes with the starburst look. I used an aqua solid for binding, and ta da… ready for the baby! To be honest, I’d love it as a throw for the couch, but I couldn’t force myself to make any more of those starburst blocks! 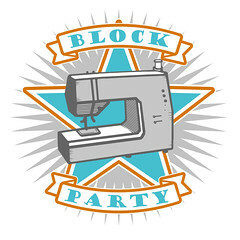 If you want to try this block out, I have a tutorial posted here. This entry was posted in [search] Liberated Quilts, 2010 Finished Quilts, baby, Finished Quilts, Posts about Quilts, Quilts and tagged baby, baby quilt, handmade, playmat, quilt, quilting, starburst block, starburst quilt. Bookmark the permalink. I really, really LOVE this block and quilt. Thanks for the tutorial… I need to get up the courage to make some! And I can say, as the mama of a 19 month old… the baby will love it and stare and stare. wow, this is so fabulous!!! what a wonderful quilt. I just love the colors, and the grey polka dot is perfect for the back. Yay for baby sewing! I am so in love with these blocks – after seeing this I need to move it up on my to-do list! Your lucky little boy! This is the perfect playmat. I love the look of your starbursts so I started making a couple this week and boy are they more tedious and difficult than I thought! Good thing I’m only making 4 of them for a pillow. 🙂 thanks for sharing tutorial. What a lively quilt! Love the colors. I’m sure your little guy will love it. I can also vouch for the fact that baby will ADORE this quilt 🙂 My 7mo old LOVES quilts and will stare, grab at, and chew on anything with bright colors! Well done! Absolutely gorgeous quilt! What a lucky baby! Such a fun little quilt. What a perfect quilt for your baby’s playmat! 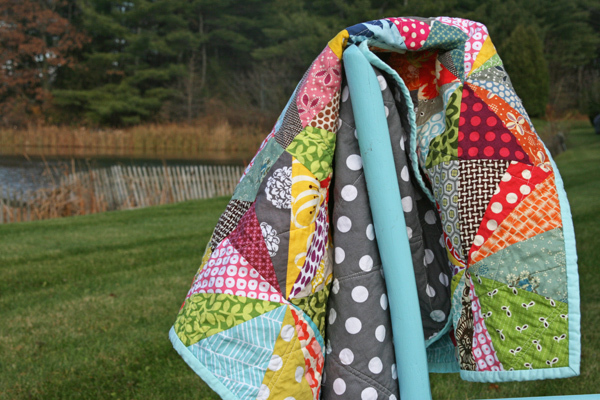 I love that polka dot fabric you chose for the backing – perfect! 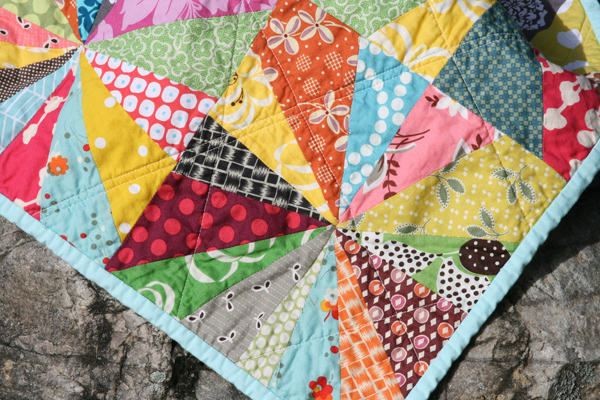 The random quilting lines work so well with the starburst blocks, giving this great movement to the eye. Yes, the grey and white polka dot is too perfect! Baby will love it so much. I LOVE that as a backing. Perfect! I’m so happy for you to be sewing for your baby!!! This is truely a fantastic quilt, one to go on my to do list for sure, its definitely a great pattern to use bright colours as you have too. Fantastic quilt – love the random straight line quilting. I really really LOVE this quilt! It is just so very happy! So cute! Bright colors when you want him to stay awake and be alert (those first few weeks when they have night and day mixed up), and the soothing grey and white for when you want him to be drowsy and nod off! 😎 Are you working on names yet? Is he going to be Morgan Jr? I really adore everything about this quilt, as I am sure baby will too. and baby will defiantly get a lot of color stimulation while playing! I can really appreciate the straight lines. I’m about to grab my seam ripper and get back to those lines myself. The baby will love the colors just as much as we all do. I love the aqua & grey dots! 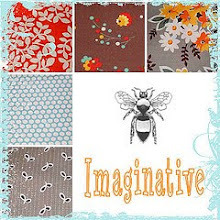 It makes all the fabrics pop…beautiful! Oh, stink!! I LoVe this quilt!!! I love your quilt; it’s so fun and beautiful!! The grey is just perfect for the back. This is lovely! This will make a great play mat! Not to be gross, but the busy pattern will forgive any unidentified stains that come with the little ones. ashley … your quilt is gorgeous … i love the fmf, it’s so colorful … and your quilting is wonderful … i have a question: when you straight-line quilted the quilt, do you begin in the middle of the quilt and work out from there? or do you proceed like stipple quilting, beginning at the edge? i’m just getting started quilting and wondered how you do this? I can tell this baby is going to be swaddled/blanketed in quilted, gorgeous goodness at all times. I’m so happy for you guys Ashley!! It looks so great, Ashley! Perfect for a playmat. 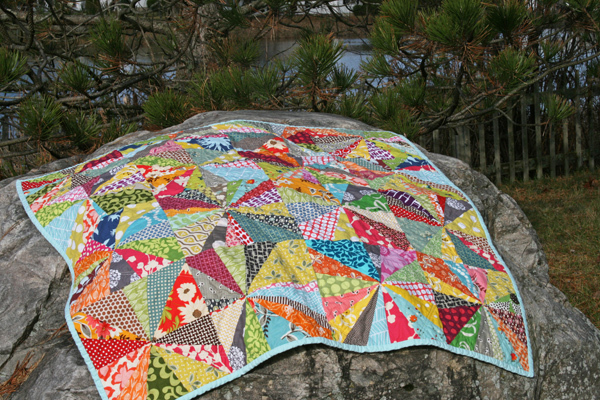 I really love all the wild and crazy colors in this quilt. Makes me smile just taking it all in. Wonderful! This is so amazing!!! I made a Scrappy nap pillow with the same starburst design from Handmade Beginnings. This quilt would go great with it! Thankyou soooooo much for sharing this with us. I love it!!!!!! 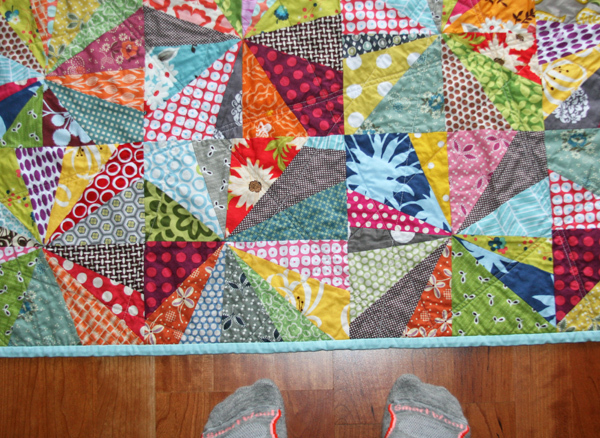 Just posted about my quilt where I used your tutorial. Thanks!